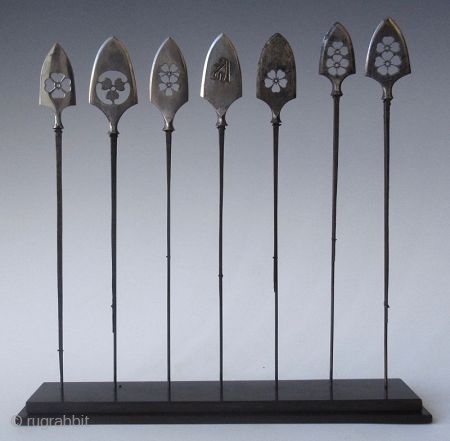 a collection of arrowheads, pierced with the single cherry flower of the Sada-uji and the double cherry flower of the Matamasa family crests. The central arrow with the Sanskrit character for protection by the deity Hachiman, signed Minamoto no Mitsumasa, Nobokuni of Chikuzei. Both clans Sada-uji and Matamasa were in support of the Tokugawa clan. Yanagi-Ba (Willow Leaf) These YaNoNe are very elaborate with saw-cut patterns like Sakura (cherry blossom), Inome (heart shape or boars eye), Mon patterns (family crests), dragons ad other geometrical patterns.